My focus turned to this race almost immediately after the British Champs in July; in fact after enjoying it so much for the first time in 2014, I immediately knew it was one I wanted to race and, ideally win again. To an extent, I really enjoy the lapped, city center type courses of many of the AG championship events, but they’re more about the competition itself and the end result, rather than the sense of achievement of finishing or racing in great locations. 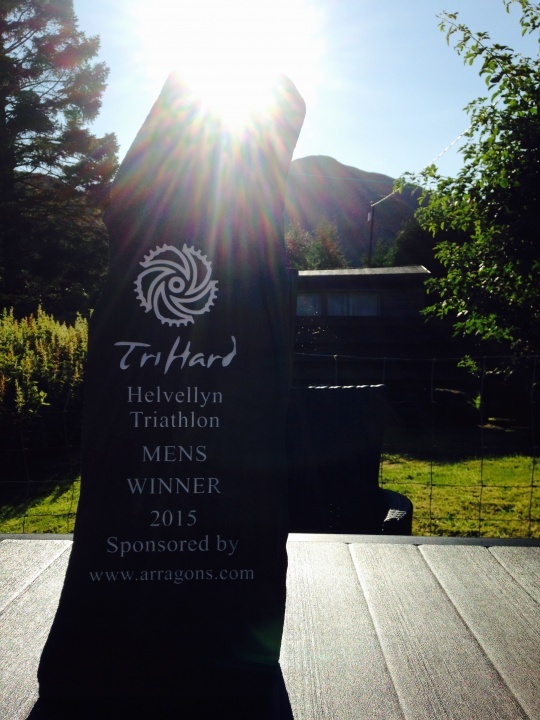 Listening to the ‘Cup of Tri’ podcast on the drive up, Rob Wilby summed it up well, “they’re not the kind of races where you look up and think, wow, what a great setting;” Helvellyn is one of those races. On Tuesday afternoon at work, something didn’t feel quite right, and I knew this wasn’t the usual sort of race week tricks – where your mind and body start playing with each other. I got home, got into bed and pretty much stayed there for the next 72 hours. 3 days in bed before a race isn’t the end of the world, but the serious stomach cramps and inability to eat were far from ideal. 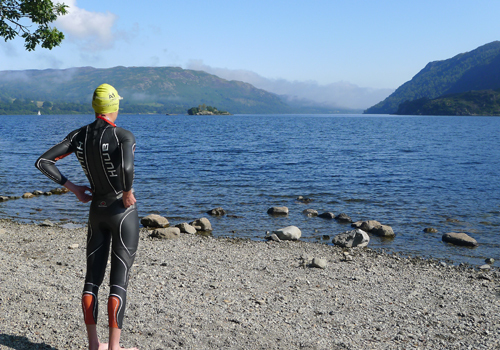 After initially feeling well enough for a swim on Thursday morning, I quickly realized that I wasn’t as well as I’d first thought, and so I headed back to bed and back to square one, with some serious concerns about not being able to race. Fortunately, things improved and by Friday I could eat and set about making up for the lost days with more white toast than I’ve probably had in the last 3 years. By Saturday I was even better and come Sunday, well I was just happy to be racing. Comparing race times on different courses, or even the same course on a different day, with different conditions, can often be fruitless. For a second year in a row, the weather was beautiful, with clear blue sky, great conditions for racing, so similar enough to provide some credible comparisons against last year. After the gun went, 3 others and I were soon in clear water, with a short break from the rest of the field. We came together at the first buoy and stayed together until after the second buoy before splintering into two. Two veered off to the right, while another and I maintained a straight line towards the next buoy, about 600 meters ahead at the other side of the lake. I was swimming just in behind and thought I’d made a good choice, but although we had a good line, the chap I was following started to slow down. I needed to go it alone and was annoyingly 5-10m back from the other two, but came out of the water in 3rd place, just 15-16 seconds off the lead. I didn’t know at the time, but I’d had a good swim (19:57 around about 2 mins quicker than last year) and as frustrating as it was to be just off the lead, I knew I was ‘ahead of schedule’ and that things were looking good. In a race like Helvellyn, 15 seconds isn’t much of a gap, but tactically and psychologically, it can have a big impact, especially if it means you or someone else can gain a gap on the bike, just get out of sight, or put enough distance between you, so that they can’t get on your wheel and stick with you. 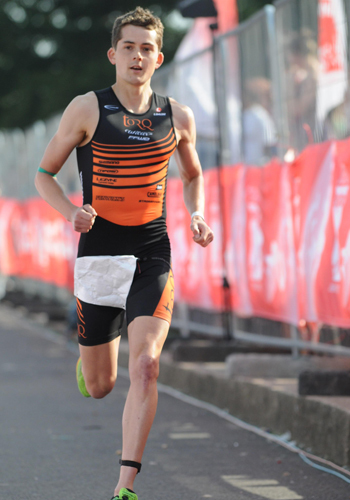 I had another good transition (the second since racing in the new Huub Archimedes, which has had some great tweaks, which have helped shave some extra seconds off in T1), and was out onto the bike in 1st place – with just enough of a gap back to 2nd place. After a km or two on rolling hills, the course kicked up and the gap grew bigger and bigger. 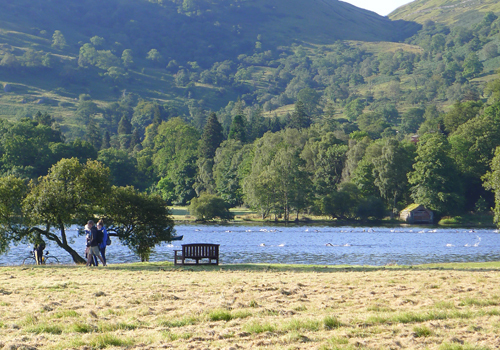 As the course meandered up into the lakes, there’d be times where I’d be out of sight of 2nd, which was a big boost for me and probably a demoralizing blow for them. Leading from the front is great, but it comes with the risk of subconsciously easing off – if you know there is no one to chase. However, soon I had enough to think about, as the 20% gradient climb up “The Struggle,” to Kirkstone Pass, rapidly approached. The ‘Struggle’ was tough, but not too tough, and I’m more than happy climbing hills on the bike. Once over the top of Kirkstone Pass, there was no need to take any silly risks on the descent back down towards Patterdale. With the exception of a short stop behind a motor home, I arrived back in transition. Just before getting in, I checked my bike time to see 01:41:51, a huge 5 minute improvement over last year. Leaving for the run, I spotted 2nd place just as he made the turn off the course towards T2, which gave me a decent 2-3 min buffer, a good place for me to be in starting the run in any race. Whilst the run is known for summiting the 3,000 odd ft. peak of Helvellyn, the hardest bit is the first steep climb. Too steep to properly run, too low for any cooling breeze, and so soon after the bike, that it really just kills your lower back. That being said, I felt good and my physical and psychological comfort was also boosted as 4 weeks before, I’d made the trip up for a couple of laps of the bike course, which I’d also back ended with the run up and down to the summit. All that had been achieved at the end of a week of training and two climbs up “Ihe Struggle” – that run was really tough. So, with that memory still fresh in my mind to draw on, the legs felt pretty good (train hard, race easy as they say). Reaching the top was a great feeling, and by the time I’d got there I’d built up a pretty healthy lead. I knew there was still a long way till the end, but barring a catastrophe, the race was sewn up. With the win all but sealed, I tried not to think about the possibility of a course record; after a good swim and bike, I knew it could be possible, but I also knew I was only one badly placed foot or loose rock away from a twisted ankle, and a good day turning bad very quickly. I took the descent relatively steady, a course record would be a bonus and, with another big race in two weeks, I didn’t want to completely ruin myself. I kept myself in one piece and clocked in a 01:23:07, an overall finish time of 03:27:05, 05:38 minutes quicker than last year and a new course record! Taking into account the less than ideal lead up, I was so pleased just to be there in a great race, on a stunning day, so to take the win too, is just massively satisfying. To have the course record for this race, with the people who’ve done it before me (I have to mention Alistair Brownlee as one of them, although I don’t think he’d even hit puberty when he did it), is one of my proudest moments since getting into triathlons. Knowing there was still room to bring this down on the run also gives an extra incentive to better it next year.